NASHVILLE — State officials hope to have Tennessee National Guard recruiters back in their storefront offices in Chattanooga and across the state next week as final touches on security upgrades are made in response to the July 16 deadly attack. "We're ready to go back to business," state Adj. Gen. Max Haston said, noting National Guard recruiters have been working out of armories since July. The temporary relocation of the seven offices, many in suburban strip malls, was prompted by 24-year-old Mohammad Youssef Abdulazeez's Chattanooga shooting rampage. Abdulazeez first shot at a U.S. military recruiting office, located next door to a state National Guard office in a Lee Highway strip mall. The gunman then drove to the U.S. Naval Reserve Center on Amnicola Highway, where he killed four Marines and fatally injured a Navy petty officer before he was shot to death during a confrontation with Chattanooga police. 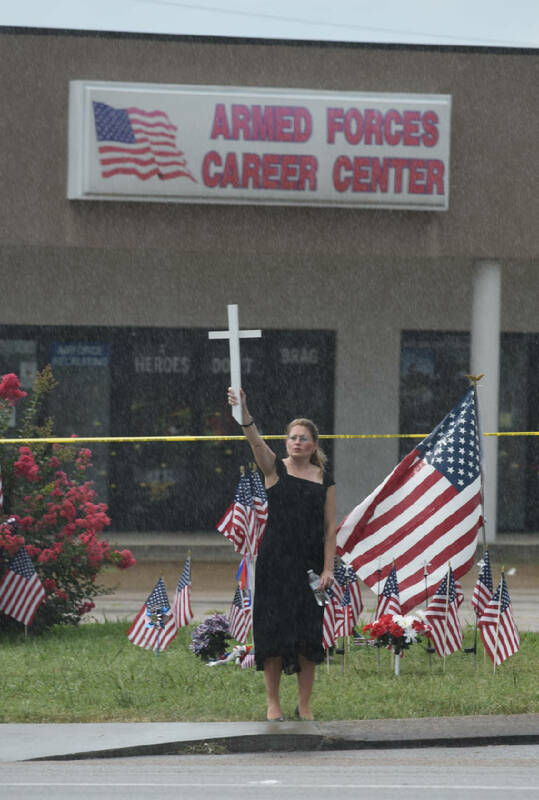 Lisa Camp stands in the rain and holds up a cross in front of the Armed Forces Career Center on Lee Highway on Sunday, July 19, 2015, in Chattanooga, Tenn. A Thursday terrorist attack at this location and the U.S. Naval and Marine Reserve Center on Amnicola Highway killed four Marines and one member of the U.S. Navy. The shootings prompted a national discussion about U.S. and National Guard security on American soil in an age of worldwide extremism. Federal law enforcement officials have balked at calling Abdulazeez a terrorist, instead referring to him as a "violent homegrown extremist." But Vice President Joe Biden called him a "perverted jihadist" during a Chattanooga memorial service. After the attack in Chattanooga, Gov. Bill Haslam directed Haston to review Tennessee's recruiting office and armory security and examine whether Guard members should be allowed to carry handguns. Haston temporarily relocated the recruiters to more secure armories while security fixes were made. Military officials favor the storefronts because they provide easier access to would-be recruits. Haston has since changed state policy to let Guard members with state-issued handgun carry permits go armed at state-owned facilities. Because the recruiting center leases are handled by U.S. military officials, he needed to first get the Pentagon's approval. Haston announced in August he received authority for properly trained Guard members to carry federally issued sidearms at the recruiting centers or on federal property, including vehicles. "They absolutely told us we can do what we want to on that," Haston said this week. "So they'll be carrying federal weapons." "The big issue," Haston said, has been "getting all of our recruiters requalified in their weapons systems because they're going to be armed." Randy Harris, the state military department's director of public affairs, said recruiters will likely be sent back to the Chattanooga area on Tuesday or Wednesday. The same goes for other storefront facilities in East and West Tennessee. Middle Tennessee recruiters could be back in their storefront offices as early as Monday, Harris said. Harris declined to cite specifics about the upgrades, but Haston told state lawmakers during hearings in August they include items such as adding material to large plate-glass windows to prevent them from shattering when fired on, as well as other measures. State House Majority Leader Gerald McCormick, R-Chattanooga, himself a military veteran, said, "I trust Gen. Haston's judgment on that and I hope he's made arrangements for them to protect themselves, and I trust that he has. He's a knowledgeable guy." Contact Andy Sher at asher@timesfreepress.com, 615-255-0550 or via Twitter @AndySher1.